Sometime in November 2010, I withdrew money from my savings to let my family go for a shopping in SM Mall here in Bacolod, and also to treat our returned missionary, Gilbor Junior who is fresh from his 2-year mission in Butuan Philippines Mission in Mindanao, and the 8th birthday of our grandson, Toto Bryan. I was surprised when my wife told me: "Why should you not purchase a laptop of your own? It's not a good practice to always borrow from others every time you've a seminar or workshop." Though I've a desktop at home, but in seminar or work-related conference I've had as a school principal, I need a laptop. She had sense therefore! However, I'm flabbergasted for I couldn't decide for just a snap of a finger for the laptop's price is too costly. Besides, I don't know what brand or quality of a laptop is best. Anyway, my excitement was getting intense for I've a ready cash on hand. Well, I canvassed all computer kiosks or outlets in SM mall. Knowing my dilemma, our son suggested that I've to compare the features first of every computer as to their usability, durability, and availability of parts and service by reading its brochure. Then consider the prices later. I followed his bid. And this is what I got: a brand new acer, emachines D730z. This is a new eMachine D730z laptop which offers the latest and greatest in the entertainment capacity. 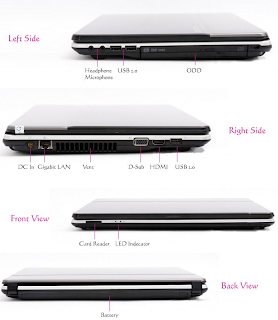 the laptop boasts 16:9 aspect ratio with HD support on its 14-inch display. Complementing the visuals, the D730z laptop also comes with a two built-in Hi-Definition speakers, so the sound quality matches up with the awesome picture. 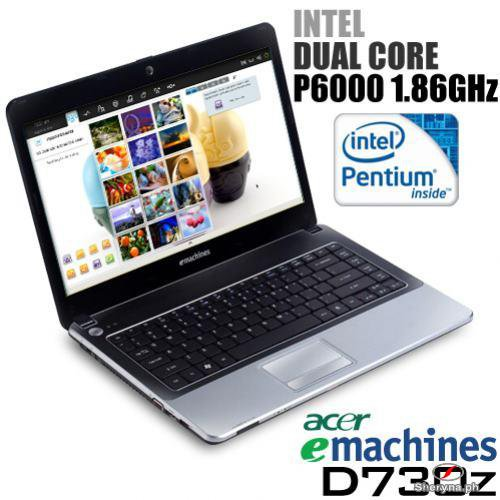 It has an Intel® Pentium® processor P6000 (1.86 GHz,3 MB L3 cache,1066 MHz FSB), supporting Intel® Smart Cache. It boosts with 1.3mp Webcam, a built-in high-resolution webcam and MIC to allow communication with ease. It is ready for image recording wherein sharing video experiences without missing a beat! This is enhanced by a 802.1m wireless communication protocols with a rate of up to 100mbps. In short, this is Wi-Fi certified. The LAN connection with data transfer rate up to 1000mb/s provides new generation connectivity for the broadband era. It is Gigabit LAN which is ideally for seamless internet connection such as a uniform stream of data or images. It is also backed up with Bluetooth 3.0 HS. It can connect devices like mobile phones, laptops, printers, digital cameras, and even a refrigerator, microwave oven, air conditioning temperature. It is operating in frequency range from 2.4 to 2.48 GHz. It has 4-in-1 Multimedia Card Slot which can help communicate with the laptop memory card quickly to store or share files quickly such as USB. This is a card reader. And it has a multi-gesture touchpad, supporting two-finger scroll, pinch, rotate, flip. It allows to manipulate screen display with just the tip of a finger. Curious as I was upon arriving home, I searched right away the Net. And I was surprised that I did the best choice. My questions had been answered why I have to buy emachines D730z. 1. It's branded from ACER. 2. It's Intel Pentium P6000 which has L3 Cache, 3MB Smart Cache, L1 and L2 is multitasking. 3. It's a 2GB DDR3, Memory expandable up to 8GD DDR3. 4. It's a 14.0" HD LED-Backlight TFT LCD with glare Panel, Mercury free, and environment friendly. I've have no regret that I bought this quality laptop for my computer and internet needs for Php23,836.00 in cold cash. Other sold it to Php28,635.00. I'm very grateful for my very supportive, understanding wife and to my son's practical suggestion. i don't know when i'll consider getting a new laptop since i'm still very happy with my MBP. It's only P6000? Tama po ba intindi ko? That is cheap then and the specs are good na for a personal blogger and one who does workshops. The cost is Php23,000 not Php6,000. the P6000 is referred to the Pentium installed inside. Gets mo? That was really a best buy sir.:-). Happy blogging. :-).